Lifted from the excellent Consciousness of Sheep blog…. Irv Mills has published the fifth and last part of his 5 part series called ‘The Bumpy Road Down’, previous instalments being available here. In my last post I started talking about some of the changes that will happen along the bumpy road down and the forces and trends that will lead to them. (The bumpy road down being the cyclic pattern of crash and partial recovery that I believe will characterize the rest of the age of scarcity). These changes will be forced on us by circumstances and are not necessarily how I’d like to see things turn out. I’ve once again included the stepped or “oscillating” decline diagram from previous posts here to make it easier to visualize what I’m talking about. This diagram isn’t meant to be precise, certainly not when it comes to the magnitude and duration of the oscillations, which in any case will vary from one part of the world to the next. The trends I want to talk about today are all interconnected. You can hardly discuss one without referring to the others, and so it is difficult to know where to start. But having touched briefly on a trend toward increased authoritarianism at the end of my last post, I guess I should continue trends in politics. Currently there seems to be a trend towards right wing politics in the developed world. I think anyone who extrapolates that out into the long run is making a basic mistake. Where right wing governments have been elected by those looking for change, they will soon prove to be very inept at ruling in an era of degrowth. Following that, there will likely be a swing in the other direction and left wing governments will get elected. Only to prove, in their turn, to be equally inept. Britain seems to be heading in this direction, and perhaps the U.S. as well. Another trend is the sort of populism that uses other nations, and/or racial, ethnic, religious and sexual minorities at home as scapegoats for whatever problems the majority is facing. This strategy is and will continue to be used by clever politicians to gain support and deflect attention from their own shortcomings. Unfortunately, it leads nowhere since the people being blamed aren’t the source of the problem. During the next crash and following recovery governments will continue to see growth as the best solution to whatever problems they face and will continue to be blind to the limits to growth. Farther down the bumpy road some governments may finally clue in about limits. Others won’t, and this will fuel continued growth followed by crashes until we learn to live within those limits. One thing that seems clear is that eventually we’ll be living in smaller groups and the sort of political systems that work best will be very different from what we have now. Many people who have thought about this assume that we’ll return to feudalism. I think that’s pretty unlikely. History may seem to repeat itself, but only in loose outline, not in the important details. New situations arise from different circumstances, and so are themselves different. Modern capitalists would never accept the obligations that the feudal aristocracy had to the peasantry. Indeed freeing themselves of those obligations had a lot to do with making capitalism work. And the “99%” (today’s peasantry) simply don’t accept that the upper classes have any right, divine or otherwise, to rule. In small enough groups, with sufficient isolation between groups, people seem best suited to primitive communism, with essentially no hierarchy and decision making by consensus. I think many people will end up living in just such situations. In the end though, there will still be a few areas with sufficient energy resources to support larger and more centralized concentrations of population. It will be interesting to see what new forms of political structure evolve in those situations. For the last couple of decades declining surplus energy has caused contraction of the real economy. Large corporations have responded in various ways to maintain their profits: moving industrial operations to developing countries where wages are lower and regulations less troublesome, automating to reduce the amount of expensive labour required, moving to the financial and information sectors of the economy where energy decline has so far had less effect. The remaining “good” industrial jobs in developed nations are less likely to be unionized, with longer hours, lower pay, decreased benefits, poorer working conditions and lower safety standards. The large number of people who can’t even get one of those jobs have had to move to precarious, part time, low paying jobs in the service industries. Unemployment has increased (despite what official statistics say) and the ranks of the homeless have swelled. Since workers are also consumers, all this has led to further contraction of the consumer economy. We can certainly expect to see this trend continue and increase sharply during the next crash. Our globally interconnected economy is a complex thing and that complexity is expensive to maintain. During the crash and the depression that follows it, we’ll see trends toward simplification in many different areas driven by a lack of resources to maintain the existing complex systems. I’ll be discussing those trends in a moment, but it is important to note that a lot of economic activity is involved in maintaining our current level of complexity and abandoning that complexity will mean even more economic contraction. At the same time, small, simple communities will prove to have some advantages that aren’t currently obvious. All this economic contraction means that almost all of us will be significantly poorer and we’ll have to learn to get by with less. As John Michael Greer says, “LESS: less energy, less stuff, less stimulation.” We’ll be forced to conserve and will struggle to get by with “just enough”. This will be a harshly unpleasant experience for most people. For the last few decades globalization has been a popular trend, especially among the rich and powerful, who are quick to extol its many supposed advantages. And understandably so, since it has enabled them to maintain their accustomed high standard of living while the economy as a whole contracts. On the other hand, as I was just saying, sending high paying jobs offshore is a pretty bad idea for consumer economies. And I suspect that in the long run we’ll see that it wasn’t really all that good for the countries where we sent the work, either. During the crash we’ll see the breakdown of the financial and organizational mechanisms that support globalization and international trade. There will also be considerable problems with shipping, both due to disorganization and to unreliable the supplies of diesel fuel for trucks and bunker fuel for ships. I’m not predicting an absolute shortage of oil quite this soon, but rather financial and organizational problems with getting it out of the ground, refined and moved to where it is needed. This will lead to the failure of many international supply chains and governments and industry will be forced to switch critical systems over to more local suppliers. This switchover will be part of what eventually drives a partial recovery of the economy in many localities. In a contracting economy with collapsing globalization there would seem to be little future for multi-national corporations, and organizations like the World Bank and the IMF. While the crash may bring an end to the so called “development” of the “developing” nations, it will also bring an end to economic imperialism. At the same time, the general public in the developed world, many of whom are already questioning the wisdom of the “race to the bottom” that is globalization, will be even less likely to go along with it, especially when it comes to exporting jobs. Still, when the upcoming crash bottoms out and the economy begins to recover, there will be renewed demand for things that can only be had from overseas and international trade will recover to some extent. Impoverished organizations such a governments, multi-national corporations and international standards groups will struggle to maintain today’s high degree of centralization and eventually will be forced to break up into smaller entities. Large federations such as Europe, the US, Canada and Australia will see rising separatism and eventually secession. As will other countries where different ethnic groups have been forced together and/or there is long standing animosity between various localities. If this can be done peacefully it may actually improve conditions for the citizens of the areas involved, who would no longer have to support the federal organization. But no doubt it will just as often involve armed conflict, with all the destruction and suffering that implies. The cessation of services from the FIRE industries and the resulting breakdown of international (and even national) supply and distribution chains will leave many communities with no choice but to fend for themselves. One of the biggest challenges at first will be to get people to believe that there really is a problem. Once that is clear, experience has shown that the effectiveness of response from the victims of disasters is remarkable and I think that will be true again in this case. There are a lot of widely accepted myths about how society breaks down during disaster, but that’s just what they are: myths. Working together in groups for our mutual benefit is the heart of humanity’s success, after all. Government response will take days or more likely weeks to organize, and in the meantime there is much we can do to help ourselves. Of course it helps to be prepared… (check out these posts from the early days of this blog: 1, 2) and I’ll have more to say on that in upcoming posts. The question then arises whether one would be better off in an urban center or a rural area such as a small town or a farm. Government relief efforts will be focused on the cities where the need will be greatest and the response easiest to organize. But just because of the millions of people involved, that response will be quite challenging. Rural communities may well be largely neglected by relief efforts. But, especially in agricultural areas, they will find fending for themselves much more manageable. I live in a rural municipality with a population of less than 12,000 people in an area of over 200 square miles (60 people per sq. mile, more than 10 acres per person). The majority of the land is agricultural, and supply chains are short, walking distance in many cases. Beef, dairy and cash crops are the main agricultural activities at present and they can easily be diverted to feed the local population. Especially if the food would go to waste anyway due to the breakdown of supply chains downstream from the farm. So I think we’re likely to do fairly well until the government gets around to getting in touch with us again, probably sometime after the recovery begins. In subsequent crashes the population will be significantly reduced and those of us who survive will find ourselves living for the most part in very small communities which are almost entirely relocalized. The kind of economy that works in that situation is very different from what we have today and is concerned with many things other than growth and profit making. The move toward automation that we’ve seen in the developed world since the start of the industrial revolution has been driven by high labour costs and the savings to be had by eliminating labour from industrial processes as much as possible. That revolution started and proceeded at greatest speed in Britain where labour rates where the highest, and still hasn’t happened in many developing nations where labour is very cheap. Sadly, the further impoverishment of the working class in Europe and North America will make cheaper labour available locally, rather than having to go offshore. During the upcoming crash, and in the depression following it, impoverished people will have no choice but to work for lower rates and will out compete automated systems, especially when capital to set them up, the cutting edge technology needed to make them work, and the energy to power them are hard to come by. Again, the economic advantages of simplicity will come into play when it is the only alternative, and help drive the recovery after the first crash. In the initial days of the coming crash there will be problems with the distribution systems for food, medical supplies and water treatment chemicals, all of which are being supplied by “just in time” systems with very little inventory at the consumer end of the supply chain. To simplify this discussion, I’ll talk primarily about food. It is often said that there is only a 3 day supply of food on the grocery store shelves. I am sure this is approximately correct. In collapse circles, the assumption is that, if the trucks stop coming, sometime not very far beyond that 3 day horizon we’d be facing starvation. There may be a few, incredibly unlucky, areas where that will be more or less true. But, depending on the time of year, much more food than that (often more than a year’s worth) is stored elsewhere in the food production and distribution system. The problem will be in moving this food around to where it is needed, and in making sure another year’s crops get planted and harvested. I think this can be done, much of it through improvisation and co-operation by people in the agricultural and food industries. With some support from various levels of government. There will be some areas where food is available more or less as normal, some where the supply is tight, and other areas where there is outright famine and some loss of life (though still outstripped by the fecundity of the human race). In many ways that pretty much describes the situation today but supply chain breakdown, and our various degrees of success at coping with it, will make all the existing problems worse during the crash. But once the initial crash is over, we have a much bigger problem looming ahead, which I think will eventually lead to another, even more serious crash. With my apologies to my “crunchy” friends, modern agriculture and the systems downstream from it supply us with the cheapest and safest food that mankind has known since we were hunters and gatherers and allows us (so far) to support an ever growing human population. The problem is that this agriculture is not sustainable. It requires high levels of inputs–primarily energy from fossil fuels, but also pesticides, fertilizers and water for irrigation–mostly from non-renewable sources. And rather than enriching the soil on which it depends, it gradually consumes it, causing erosion from over cultivation and over grazing, salinating the soil where irrigation is used and poisoning the water courses downstream with runoff from fertilizers. We need to develop a suite of sustainable agricultural practices that takes advantage of the best agricultural science can do for us, while the infrastructure that supports that science is still functioning. The organic industry spends extravagantly to convince us that the problem with our food is pesticide residues and genetically engineered organisms, but the scientific consensus simply does not support this. The organic standards include so called “natural” pesticides that are more toxic than modern synthetic ones, and allow plant breeding techniques (such as mutagenesis) that are far more dangerous than modern genetic engineering. Organic standards could certainly be revised into something sustainable that retains the best of both conventional and organic techniques, but this has become such a political hot potato that it is unlikely to happen. As I said above, during the upcoming crash one of the main challenges will be to keep people fed. And I have no doubt that this challenge will, for the most part, be successfully met. Diesel fuel will be rationed and sent preferentially to farmers and trucking companies moving agricultural inputs and outputs. Supplies of mineral fertilizers are still sufficient to keep industrial agriculture going. Modern pesticides actually reduce the need for cultivation and improve yields by reducing losses due to pests. It will be possible to divert grains grown for animal feed to feed people during the first year when the crisis is most serious. Industrial agriculture will actually save the day and continue on to feed the growing population for a while yet. We will continue to make some improvement in techniques and seeds, though with diminishing returns on our efforts. This will come to an end around mid century with the second bump on the road ahead (starting at point “g” on the graph), when a combination of increasing population, worsening climate, and decreasing availability and increasing prices of energy, irrigation water, fertilizer, pesticides and so forth combine to drastically reduce the output of modern agriculture. Widespread famine will result, and this, combined with epidemics in populations weakened by hunger, will reduce the planet’s human population by at least a factor of two in a period of a very few years. Subsequent bumps as climate change further worsens conditions for farming will further reduce the population, resulting in a bottleneck towards the end of this century. Without powered machinery, synthetic fertilizers and pesticides and with drastically reduced water for irrigation, agricultural output will fall off considerably. And our population will fall to match the availability of food. I do think it unlikely that the human race will be wiped out altogether, but our numbers will likely be reduced by a factor of ten or more. It is a sad fact that many people, communities and nations, when faced with the sort of challenges I’ve been talking about here, will respond with violence. In the remaining years leading up to the next crash, I think it is likely that even the least stable of world leaders (or their military advisors) will remain well aware of the horrific consequences of large scale nuclear war, and will manage to avoid it. As has been the case since the end of WWII, wars will continue to be fought by proxy, involving smaller nations in the developing world, especially where the supply of strategic natural resources are at issue. War is extremely expensive though and, even without the help of a financial crash, military spending already threatens to bankrupt the U.S. As Dmitry Orlov has suggested, after a financial crash, the U.S. may find it difficult to even get its military personnel home from overseas bases, much less maintain those bases or pursue international military objectives. But even in the impoverished post-crash world, I expect that border wars, terrorism, riots and violent protests will continue for quite some time yet. Whether from the ravages of war, climate change or economic contraction many areas of the world, particularly in areas like the Middle East, North Africa and the U.S. southwest, will become less and less livable. People will leave those areas looking for greener pastures and the number of refugees will soon grow past what can be managed even by the richest of nations. This will be a problem for Europe in particular, and more and more borders will be closed to all but a trickle of migrants. Refugees will accumulate in camps and for a while the situation will find an uneasy balance. As we continue down the bumpy road, though, many nations will lose the ability to police their borders. Refugees will pour through, only to find broken economies that offer them little hope of a livelihood. Famine, disease and conflict will eventually reduce the population to where it can be accommodated in the remaining livable areas. But the ethnic makeup of those areas will have changed significantly due to large scale migrations. I’ve been talking here about some of the changes that will be forced upon us by the circumstances of collapse. I’ve said very little about what I think we might do if we could face up to the reality of those circumstances and take positive action. That’s because I don’t think there is much chance that we’ll take any such action on a global or even national scale. It’s time now to wrap up this series of posts about the bumpy road down. At some point in the future I intend to do a series about of coping with collapse locally, on the community, family and individual level. I think there is still much than can be done to improve the prospects of those who are willing to try. Irv Mills has now published the third episode in his “Bumpy Road Down” series. It’s gotten a lot of interest on Facebook, and I think his own blog is getting a lot of hits too, as the interest in collapse ramps up everywhere as more and more people are waking up to the fact most things are going awry in the world…. I’ve already told him I disagree with his collapse diagram. For starters, the carrying capacity line is neither straight nor flat. So much farm land, particularly in India and North America has been decimated by fossil fuled fertilisers, that re-instating them to their former organic glory will be a huge challenge that will require a long time during which a lot of people will unfortunately starve. On top of this, we have wrecked global fisheries, which were an important pre FF source of food… My best take on this is Paul Chefruka’s diagram which I published with his article here… It too shows a bumpy road down, and no carrying capacity limit. I think the post FF carrying capacity will be the same as the pre FF carrying capacity, only worse thanks to the ecological damage our insane use of FFs has caused. How one quatifies this, I don’t know, but I’m sure it would take a lot of research. Anyhow, enjoy the read, and make sure you comment, I’m always interested in what you think. Leave comments at Irv’s site too…. I’m sure he’d like the feedback! In the last post in this series I talked about the next financial crash and how it may well be serious enough to spread into the non-financial sectors of the economy and effect supply chains and critical systems in ways that we did not see in the Global Financial Crisis of 2007-08. Systems that most of us depend on for the necessities of life may fail and many kollapsniks see this leading immediately and inevitably to a hard, fast and permanent crash of industrial civilization. I disagree, seeing this as just one more bump on the road down, the cyclic pattern of crash and partial recovery that I believe will characterize the rest of the age of scarcity. 1) take a systems dynamic approach to the events we are talking about. Specifically, we need to look at what happens when overshoot occurs in nature, in systems like the one we inhabit. Which is, after all, a subset of the ecosphere. Overshoot is a common enough phenomenon and usually works in fairly predictable ways. 2) look at the sort of things governments, communities and individuals can do to limit the damage of a financial crash and its spread to other critical systems. Today we are going to do that. The green line shows the behaviour over time of the population of a species which finds itself initially at a level well below the carrying capacity of its environment (the dashed blue line). Because that environment provides lots of whatever the species need to grow, it does grow. This tendency to grow in response to favourable conditions seems to be an inhernet property of life. As is always the case, this is exponential growth—it starts out slowly but eventually reaches a point where it takes off and quickly exceeds the carrying capacity of the environment. What happens then is interesting, especially since we currently find ourselves in just such a situation. You get some oscillation of the species population, above and below the carrying capacity, until it finally settles out somewhat below the carrying capacity. First, let’s be clear that it is possible to exceed carrying capacity in the short run, at the cost of damaging the environment and reducing its capacity—overpopulation has a negative effect on that capacity. There is also some time delay built in to the effect of population growth, as newly born individuals add relatively little to the species impact on the environment compared to what they will add once they have grown up. The negative feedback and the time delay result in the oscillation shown in the graph. Of course, the straight line representing carrying capacity would actually have some peaks and valleys, corresponding to how the environment responds to the stress of overpopulation and how it recovers when the population falls. If we idealized both the blue and green lines into something like a sine wave, we would see that the variation in the carrying capacity leads the variation in the population by about 90 degrees. The red line, by the way, represents a fast and permanent collapse. In order for this to happen the carrying capacity has to fall all the way down to basically nothing. This can happen for a variety of reasons, but overshoot isn’t one of them, because as soon as the population falls off below the carrying capacity, the stress on the environment is relieved and it begins to recover. There is, in fact, no such thing as a “balance of nature” and it is by no means inevitable that the oscillations damp out and the population settles down just below the carrying capacity. In many cases what we actually get is the situation in the next graph, where populations oscillate on an ongoing basis. You might think that the population of rabbits and foxes in an ecosystem would level out at steady values, but that is not in fact what is observed. 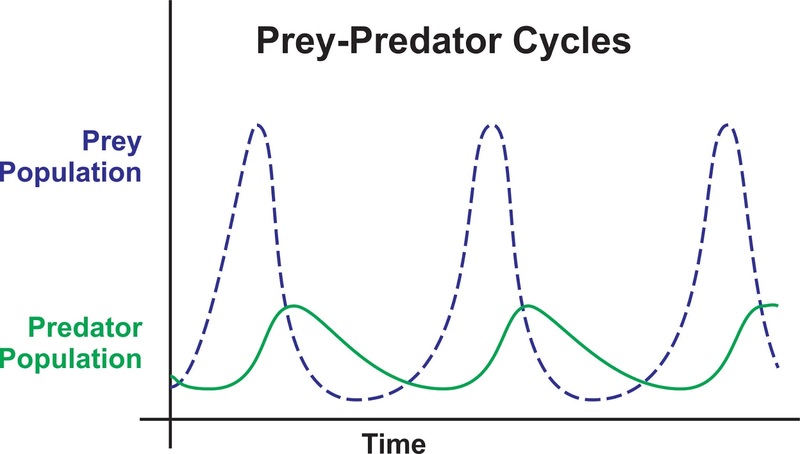 If we start at a moment when there are relatively few of each species, we see that the population of rabbits (the prey, dashed blue line) grows rapidly. It is well below the carrying capacity of the ecosystem for rabbits and there are relatively few foxes (the predators, green line). But the increasing number of rabbits make hunting easier for the foxes, and their population starts to increase too. Eventually there are enough foxes to overhunt the rabbits, resulting in a crash in the rabbit population. This is followed by a crash in the fox population, since there are no longer enough rabbits to support it. This brings us back to where we started and the cycle carries on. The reason the cycle can carry on indefinitely is that the foxes limit the rabbit population so that it never exceeds the carrying capacity of the ecosystem for rabbits—the plants the rabbits are eating never get over grazed. The situation for the human population of this planet is, as you might expect, more complex. The impact (I) that the human population has on our environment is determined not just by the size of that population (P), but also by the level of affluence (A) we are living at and effectiveness of the technology (T) we are using to maintain that affluence. This gives us the famous equation, I=PAT. Since I am going to be using the term “T” in another equation shortly, I’ll change this to I=PAD, where “D” stands for decoupling. Decoupling is the use of technology to produce affluence at a lower cost to thge environment and it is a number between 0 and 1, with 0 being the goal we would aim for, eliminating our impact altogether. In fact it is proving so difficult to get decoupling anywhere near zero that it is very unlikely to be the solution to our problems. Carrying capacity (C) also works somewhat differently for human populations. We can increase the size (S) of our environment by expanding into new areas of the world and habitats previously occupied by other species or by “indigenous” humans. We can tap into forms of energy (E) beyond just food. For somewhere between two and three million years we’ve been using fire for landscaping, for cooking our food and for heating our shelters. In each case we were using the energy in burning biomass to increase the carrying capacity of our environment, increase the value of our food, and/or expand the range of environments that we can live in. For the last few hundred years we’ve been using the energy of fossil fuels to radically increase the carrying capacity of our environment in many seemingly clever ways. Since whatever method we use to acquire energy consumes energy in the process, it’s actually the energy that is left over, available for use (the surplus energy) that’s important. This is best expressed as “Energy Returned on Energy Invested”, EROEI. This is a dimensionless number and the larger it is, the more surplus energy. When the EROEI is equal to one, the process is just breaking even and there is no point in doing it—we want a much higher EROEI. Hunter-gatherer and pre-industrial agricultural societies managed average EROEI’s in the high single digits at best. Industrial societies based on fossil fuels in the twentieth century had EROEI’s many times that high, which made possible high levels of growth and the development and use of technologies which had previously been completely out of reach. Today the average global EROEI is around 11. Which brings us to our use of tools and technology (T). With just Neolithic technology (fire, stone tools, weaving, tanning, pottery, boats, agriculture) we spread over the whole planet except for the Antarctic, occupying and thriving in environments very different from the ones where we evolved. Since the Renaissance, the Enlightenment and the Industrial Revolution our use of technology has exploded. And not just material technology, but financial, organizational and information technologies as well. All of which has enabled both our population and affluence to grow at heretofore unprecedented rates. So, the carrying capacity of this planet for the human race can be represented by the equation C=SET. Clearly, I (Impact) must be less than C (carrying capacity) or we are in overshoot. And since sometime in the late 1970s we have indeed been in overshoot. Currently the level of overshoot is around 60%. That is, our impact on the environment is 1.6 times what can be sustained on an ongoing basis. 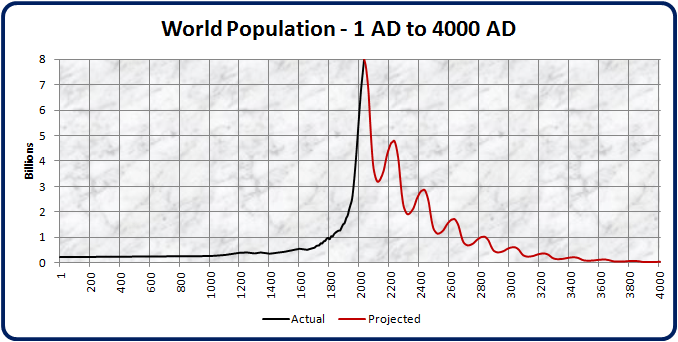 From left side of this graph to point “a” we see the long and very slow growth of the human population before the discovery of the New World. After point “a” the carrying capacity began to increase significantly as the size of our environment effectively took a large jump with the European settlement of the New World, as the use of fossil fuels greatly increased the amount of surplus energy available and as we developed numerous new technologies to use that energy. Human impact increased with the carrying capacity, as our population grew and affluence increased. The growth of carrying capacity continued until the last quarter of the twentieth century, point “b”, when depletion of fossil fuels and reduction of their EROEI, diminishing returns on technological innovation and stress on the environment from human activities started to reduce the carrying capacity. Human impact has continued to grow since then, and is now so far above carrying capacity that one has to expect a crash in the near future, point “c”. As I said in my last post, this is likely to start with a financial crash. The financial sector of the economy, since it deals largely with non-material things that don’t have much inertia, can change very quickly. It is currently under a lot of strain from huge amounts of risky debt. I favour a scenario where a spike in the price of oil, brought about as the current surplus of oil bottoms out, sets off a currency crash in one of more countries, leading to a wave of bankruptcies and governments defaulting on their debts. After point “c” human impact will start to decrease rapidly, primarily due to the effect of the financial crash on affluence. Note that I have again included a red line (and a light blue line), which represent a fast and permanent crash of both carrying capacity and population. This is possible and some would argue that climate change and ocean acidification (among other things) may be damaging the environment enough to make it the most likely outcome. I don’t think so. The ecosphere is amazingly resilient, once human impact is reduced. People have gotten the wrong impression about this because we have been playing the silly game of upping our impact and then wondering why the situation keeps getting worse, as if it wasn’t our fault. To the right is a little chart that contains some shocking information. 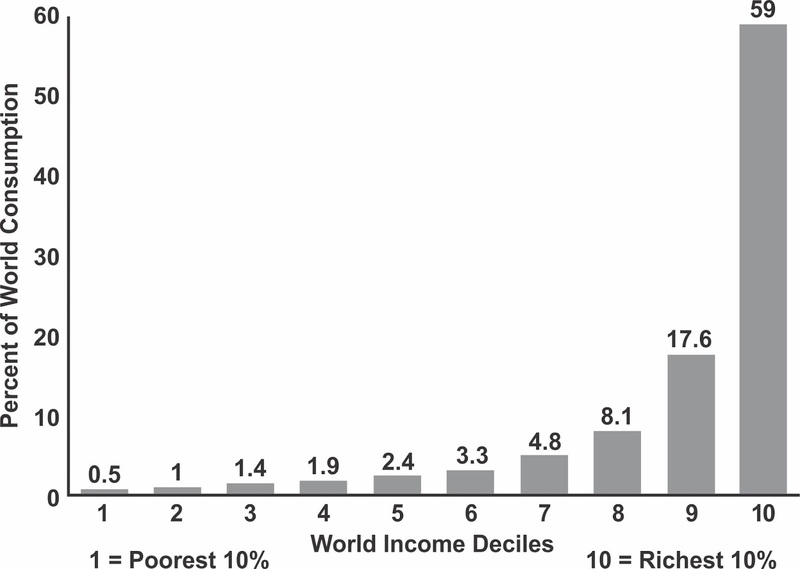 The top 20% of the human population (in terms of affluence) is responsible for 76.6% of our impact. A financial crash will be very hard on those top 20% and in the process will drastically reduce human impact. Sadly, myself and most of my readers are in that top 20%. Referring back to diagram 3, I expect that at point “d”, where “I” is finally less than “C”, the carrying capacity will begin to recover, and a while later at point “e”, human impact will begin to increase once again as well. Remember also that carrying capacity is defined by C=SET, and there is much that humanity can do to change the value of “T” in that equation. I am by no means saying that we will find a “solution” to our problems based on material technology. What I mean is that a major factor in the big decrease in carrying capacity during the upcoming crash will be the failure of our financial and organizational technology to cope with the situation. And there is a lot we can do to reorganize our financial, economic and political systems to work better under the new conditions. Once we are forced to do it. So I do expect there will be a recovery after this crash. It is very likely that during the crash the financial chaos will spread to the rest of the economy and that there will be some reduction in the growth rate of our population as the support structures provide by industrial civilization fail completely in some parts of the world. But it seems likely that human population will continue to grow until it once again outstrips carrying capacity, at point “f”. And then at point “g” we will have another crash. I suspect depletion of fossil fuels, water for irrigation and phosphorous for fertilizer, and the effects of climate change will lead to a collapse of agriculture in many parts of the world. Famine and epidemics will at that point start to rapidly reduce our population and eventually reduce it back below a once more reduced carrying capacity (point “h”) and another recovery will begin (point “i”). Beyond point “i” it is hard to say much about exact details or how many more crashes will take place. But the trend of continued oscillation with decreases in both carrying capacity and human impact will continue. The downward trend is because our current system relies on non-renewable resources that we are using up. That trend will continue until our impact can be sustained solely by renewable resources. Along the way we will go through some very hard times (point “i” and subsequent valleys in the green line) because of the damage done to the planet in the process. But eventually, with our impact drastically reduced, the ecosystems will recover. I expect that at this point we will have retained some of our technology and because of this the overall carrying capacity and our population/impact will settle out a bit above what it was in pre-industrial times. One further thing I want to emphasize is how uneven this whole process will be. Yes it is likely that the impending financial crash, because it involves systems that are highly interconnected and global in scale, will be felt to some extent over the whole planet. But the degree to which the financial chaos spreads to the rest of the economy will vary greatly from place to place. And subsequent crashes, once the high degree of global interconnection has been broken, will most likely occur at different times in different places. Wherever people are not completely dependent on global supply chains, the effects will be less severe. To the extent that they are not ravaged by climate change, some parts of the developing world where subsistence agriculture is practiced may continue on with little change. Unfortunately many areas will suffer the ravages of climate change—droughts, flooding and heat waves. Many countries (particularly in Africa and the Middle East) do not produce enough food for their own populations. With supply chains broken and agriculture struggling everywhere, these areas will find it difficult to continue importing the food they rely on. Supplies of energy and water will also prove problematical. I am well aware that all these graphs and explanations do not constitute a proof of my assertions about the bumpy road down. But I hope I have succeeded in making what I’m trying to say much clearer. It’s up to you to decide if there is anything to it or not, now that you know what “it” is. The other area I wanted to touch on today is the sort of things governments, communities and individuals can do to limit the damage when a financial crash spreads to other critical systems. As the financial crash starts to gain momentum, governments will (to whatever extent they can) use the same tools as they did in 2008 to get things under control— loans and bailouts for faltering businesses, and keeping interest rates very low. It also seems likely that, as the situation worsens, “bail-ins” will be used as well, where depositors are required to accept discounts on their deposits to reduce the pressure on failing banks. And “haircuts” where bond holders have to accept discounts on the value of those bonds in order to reduce the pressure on the governments that issued them. These efforts will have mixed results and the crash will no doubt spread to the non-financial sectors of the economy. Many governments will try switching failing critical systems over to a direct command “martial law” economy. This will be done with varying degrees of skill (or ineptitude as the case may be) and varying degrees of co-operation from their citizens. Vital materials which are in short supply due to supply chain and production breakdowns will be placed under government control and rationed (food, energy—especially diesel fuel, water treatment and medical supplies), and attempts will be made to patch supply chains and production facilities back together with whatever comes to hand. I have no doubt that this can be made to work, at least to some extent. It does require convincing the public that it is necessary and that it is being done fairly—applied equally to the rich and powerful as it is to the poor and weak. And inevitably there will be thriving black markets. Governments that already operate some of these systems directly will be better prepared and experience greater success. System that have been contracted out to the lowest bidder—companies that are primarily responsible to their stock holders rather than their customers—may fail in a variety of ghastly ways. On the other hand, I think there will also be quite a bit of quiet heroism on the part of companies and individuals in critical industries whose job it is to keep things working. These folks are for the most part competent and highly motivated, and their efforts will be more successful than you might think. Some governments will be so successful that their citizens may hardly be aware that anything is going on. In other countries, people will be reduced to relying almost entirely on what can be done locally, with locally available resources. Right wing capitalist governments whose primary obligation is to the rich and power will begin to practice wholesale abandonment of the poor and unfortunate. There are also things that can be done by local communities, families and individuals to be more self sufficient—to be able to carry on during those periods when industrial society fails to supply the necessities. Increasing local inventories in order to be more resilient in response to supply chain failures would be a good beginning. But just being clear about what the necessities are and not wasting resources try to maintain luxuries will be one of the biggest challenges. The first step is realizing that much of what we consider necessary is, in fact, not. So, as I’ve already said, I’m expecting a recovery, or rather a series of recoveries after a series of crashes. These crises are going to cause some changes in the way things work, resulting in a very different world. We’ll have a look at the trends that will lead to that new world in my next post. Post collapse, just what will we eat…..? Each year, on average each Australian farmer feeds 600 people. Agriculture powers 1.6 million Australian jobs. Australian farmers manage 48 per cent of the nation’s landmass. Cattle, wheat and whole milk are our top three commodities by value. More than 99% of Australia’s agricultural businesses are Australian owned. Out of the $58.1 billion worth of food and fibre Australian farmers produced in 2015-16 77 per cent ($44.8 billion) was exported. 6.8 million hectares of agricultural land has been set aside by Australian farmers for conservation and protection purposes. Australian farmers are among the most self-sufficient in the world, with government support for Australian farms representing just 1% of farming income. In Norway it is 62%, Korea 49%, China 21%, European Union 19% and United States 9%. In total, Australian beef cattle farmers produce 2.5 million tonnes of beef and veal each year. Australians eat an average 26kg of beef per person, per year. Australians consume an average of 45.3kg of chicken meat per person, per year. This not only cements chicken’s position as Australian consumers’ favourite meat, but also makes Australia one of the largest consumers of chicken meat in the world! In a normal year, Australia’s cotton growers produce enough cotton to clothe 500 million people. Australia produces about 3 per cent of the world’s cotton but is the fifth largest exporter, behind the USA, India, Brazil, Uzbekistan. Australian dairy farmers produce 9,539 million litres of whole milk per year with the farmgate value of milk production being $4.3 billion. On average, each Australian eats 3.08kg of dried fruit per year. Total Australian dried fruit exports in 2015–16 totalled 5,000 tonnes and was valued at $19.4 million. The Australian forestry, logging and wood manufacturing industry employs 64,300 in the forest products industry. At the end of 2010, 13,067 million tonnes of carbon was held in Australia’s forests and harvested wood products in service and in landfill. Almost all this carbon 12,841 million tonnes – 98% was stored in living forest. Australia’s grains industry accounts for more than 170,000 jobs across Australia from farm to export dock. About 65% of Australia’s grain is exported, including up to 90% of that grown per annum in Western Australia and South Australia. Australians consumed more than 27kg of pig meat per person in 2015–16; ranked second behind poultry. The Australian pig herd is free from many serious viral and bacterial diseases afflicting other pork producing countries. In 2016–17 there were 772 farmers who harvested rice, a significant increase on the 347 growers from the year prior. Australian rice growers use 50% less water to grow one kilo of rice than the world average. Australia is the world’s largest exporter of sheepmeat, and is the world’s third largest producer of lamb and mutton. In 2016–17, Australians, on average, ate 9.5 kg of mutton and lamb per person. The sugar industry directly employs some 16,000 people. The world’s principal sugar exporters in 2015–16 were Brazil, Thailand, Australia and India. Wool production for 2016–17 is forecast to increase by 4.3%, to 339 million kilograms (greasy) from the estimated 2015–16 production period. The increase is largely the result of excellent seasonal conditions in many areas resulting in higher fleece weights. So, I ask you, WHERE do our fruit and veggies come from? We may export 77% of what we produce, but it’s all meat, dairy, grains, and wool or cotton…… the money earned therefrom pays for the importation of fruit and veggies not farmed here. In a post oil crash, most of that stuff we export will no longer be made, because it all utterly depends on fertilisers and tractors and harvesters……. If we can’t afford to import non meat/dairy food, will we all turn into carnivores…? These are serious questions to ponder….. The mobile butcher came this afternoon, and cut up our two sheep, which are now in the freezer. We won’t be starving, that’s for sure! I’m no financial guru. Since studying Nicole Foss’ and Chris Martenson’s work, I have a reasonable understanding of how the economy works, enough to know it’s completely unsustainable and will eventually crash. I’m only interested in when it crashes because I worry it will all turn to dust before our new house is finished, and that could make my life difficult…. so I have to rely on proper gurus. I’d never heard of Mike Maloney until I heard him interviewed by Chris Martenson in a podcast, and my gut feeling is that he knows what he’s talking about. We don’t have stocks and shares or gold and silver, because I believe that the real investment needed is farm land, and a shelter that doesn’t need to be connected to the rest of a collapsing world, which is why I don’t really follow all this stuff. But this turned up in my newsfeed, and it’s rattled me a bit…… so glad I’ve started building! it might even be time to pull money out of the bank and stash it under the mattress…. This is an excellent video presentation by Mike Maloney at GoldSilver.com. Mike puts together some of the best quality videos in the precious metals industry. This one is a MUST SEE. If you are frustrated with the performance of gold and silver since 2012, this video shows just how insane the markets have become. The indicators and charts in Mike’s video presentation provides evidence that the market is now one GIANT BUBBLE ready to POP. While the insanity could continue a bit longer, the indicators are now a BLINKING RED LIGHT that something is seriously wrong. I highly recommend my readers to watch this video and please feel free to share it with others who are still gambling in the broader markets. Maybe it might WAKE THEM UP before it’s too late. The price of fuel..: what is going on..? Yesterday, I went to the big smoke for a medical appointment. I’m fine. But when I went to fill up to ensure I could make it home, I realised that the price of petrol had gone up by a whopping 20c/L in one hit. That’s a 14% increase……… in one day. Except that when I investigated this, the price of oil had not skyrocketed, it was still around $52 a barrel. 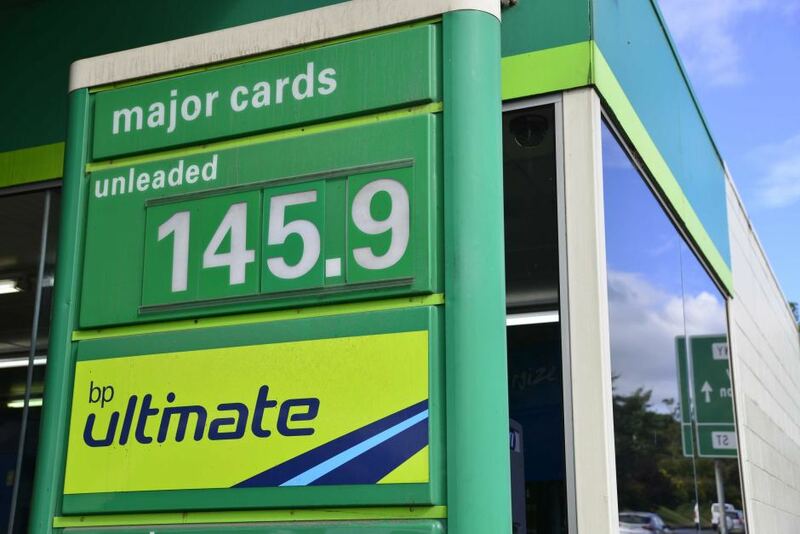 Last time petrol was this expensive, oil was at $147 a barrel….. so what’s going on? My take on this is that the oil companies must be finding it harder and harder to pay their interest bills. If they can’t make profits with oil, they’ll have to find them upstream at the pump. Furthermore, maybe Peak Oil is on the cusp of getting really serious, and this might be the tip of the iceberg……. Nafeez Ahmed has just written the following article about how dire the oil situation is becoming……. New scientific research suggests that the world faces an imminent oil crunch, which will trigger another financial crisis. A report by HSBC shows that contrary to industry mythology, even amidst the glut of unconventional oil and gas, the vast bulk of the world’s oil production has already peaked and is now in decline; while European government scientists show that the value of energy produced by oil has declined by half within just the first 15 years of the 21st century. The upshot? Welcome to a new age of permanent economic recession driven by ongoing dependence on dirty, expensive, difficult oil… unless we choose a fundamentally different path. Last September, a few outlets were reporting the counterintuitive findings of a new HSBC research report on global oil supply. Unfortunately, the true implications of the HSBC report were largely misunderstood. 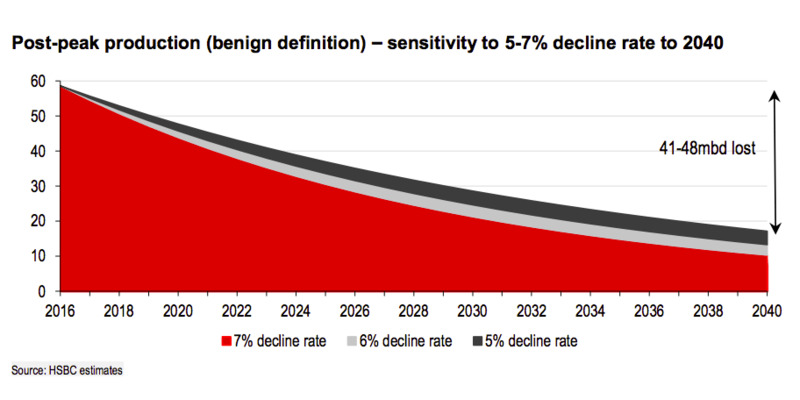 The HSBC research note — prepared for clients of the global bank — found that contrary to concerns about too much oil supply and insufficient demand, the situation was opposite: global oil supply will in coming years be insufficient to sustain rising demand. Yet the full, striking import of the report, concerning the world’s permanent entry into a new age of global oil decline, was never really explained. The report didn’t just go against the grain of the industry’s hype about ‘peak demand’: it vindicated what is routinely lambasted by the industry as a myth: peak oil — the concurrent peak and decline of global oil production. INSURGE intelligence obtained a copy of the report in December 2016, and for the first time we are exclusively publishing the entire report in the public interest. Spare capacity will have shrunk substantially by then “to just 1% of global supply/demand.” This HSBC argues, will make the market more susceptible to disruptions like those seen in Nigeria and Canada in 2016. As usual, the mainstream media is spruiking loads of rubbish, probably trying to not scare the children…… unless you peek elsewhere like this blog, or follow other bloggers who keep abreast of the truth, you could be forgiven for thinking America will be great again…. or some other such rubbish. Under the current supply glut driven by rising unconventional production, falling oil prices have damaged industry profitability and led to dramatic cut backs in new investments in production. This, HSBC says, will exacerbate the likelihood of a global oil supply crunch from 2018 onwards. So how do you improve profitability? You put the price of fuel up. Given that petrol is the single biggest purchase made by households on a weekly basis, the lift in petrol prices may lead to less household activity — a potential concern for retailers and the economy generally. High fuel prices combined with large debts is what broke the camel’s back in 2008, causing the GFC. Things are not only not different today, debt levels are even higher….. how long before GFC MkII kicks off is anyone’s guess, but it can’t be too far away now….